October 6, 2011 (Cary, NC) – The 2011-2012 season of the Nowell’s Architecture Movie Series opens at the Galaxy Cinema in Cary on Thursday, October 20, at 7:30 p.m., with the documentary “Rem Koolhaas: A Kind of Architect.” The series is hosted by Triangle Modernist Houses, an award-winning local nonprofit for the documentation, preservation, and promotion of residential Modernist design. Rem Koolhaas, 67, is a Dutch architect, architectural theorist, and Professor in Practice at Harvard University’s Graduate School of Design. He won the Pritzker Prize in 2000 and Time magazine named him one of “The World’s Most Influential People” in 2008. Other sponsors for this special screening include Kontek, Alphin Design-Build, Cherry Modern Interior Design, Dail Dixon FAIA, Studio B Architecture, ModernHomeAuction.com, and Eidolon Design. Tickets are $9 at the door. To reserve discount advance season tickets, go to www.trianglemodernisthouses.com/register.htm. Special associated offer: Bombay Beijing, an Indo-Chinese restaurant across the street from the Galaxy Cinema, offers film-goers a free ticket for every $15 spent in the restaurant that night before the movie. The Galaxy Cinema is located at 770 Cary Towne Boulevard, Cary, NC 27513; 919-463-9989. For more information and directions: www.mygalaxycinema.com. 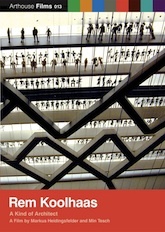 “Rem Koolhaas: A Kind of Architect” is the first of six architecture films in this year’s series. They run on certain Thursdays monthly from October through March. To see the entire line-up, go to www.trianglemodernisthouses.com/movies.